Police officers found a motorcyclist in a Paso Robles intersection suffering from injuries following a collision with a car on Monday. Shortly after 2:30 p.m., the car crashed into the motorcyclist in the intersection of Spring Street and Seventh Street, ejecting the motorcyclist from his bike. An ambulance transported the biker to Sierra Vista Regional Medical Center with major injuries. A preliminary investigation indicates the motorcyclist was traveling northbound on Spring Street while the driver of the car was trying to turn left from westbound Seventh Street onto southbound Spring Street. 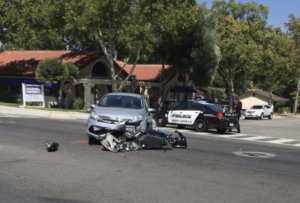 The driver of the car did not see the motorcycle and entered the intersection, resulting in the crash, a Paso Robles Police Department press release states. The driver emerged from the crash uninjured. The collision caused major damage to the motorcycle and moderate damage to the car. Officers closed Spring Street between Sixth and Eight streets while investigating the crash. Police reopened the roadway at 3:30 p.m.